Mourvedre is a Spanish and Rhone variety which is becoming more popular in Australia, especially in the Barossa Valley and McLaren Vale, after a decline in the 1980s. In a way its fortunes have mirrored those of Grenache, a common blending partner. In Spain the variety is known as Monastrell. As the origin of the grape is most likely Spanish, and there is much more grown in Spain perhaps Monastrell could be regarded as the more correct name. It was also known as Mataro in Australia and in California. Occasionally you will still find wines with that name on the label. To add to the confusion the variety was also formerly known in Australia as Esparte. In France it is used a part of the blended red wines in the Southern Rhone, often playing a supporting role to Grenache. The Mourvedre grape is also important in Provence, where it is used to make well structured roses, as well as serious reds, especially in the Appellation of Bandol. It is widely grown in Spain under the name of Monastrell. It is not so highly regarded in Spain, its main role is to produce wines with high alcohol and tannin levels. The most common use in Australia is in the increasingly popular Grenache, Shiraz Mourvedre (GSM) blends. These wines hark back to the 1960s when Australian dry red wine was labeled as claret and consumers weren't so knowledgeable about varieties or fussy about what was on the label. Before the 1980s Mourvedre was sometimes blended with Cabernet Sauvignon to make Cabernet Mataro but these blends are largely replaced by Cabernet Merlot these days. Mourvedre is used in Australia mainly as a blending partner with Shiraz and Grenache, hence the increasingly popular 'GSM' blends. A significant number of wineries make other blends using this variety. It adds a certain rustic flavour, palate length and some tannic structure to the wines. Varietal Mourvèdre and many blends age well, developing farmyard or meaty aromas. Vinodiversity's database no longer collects data about producers of Mourvedre. 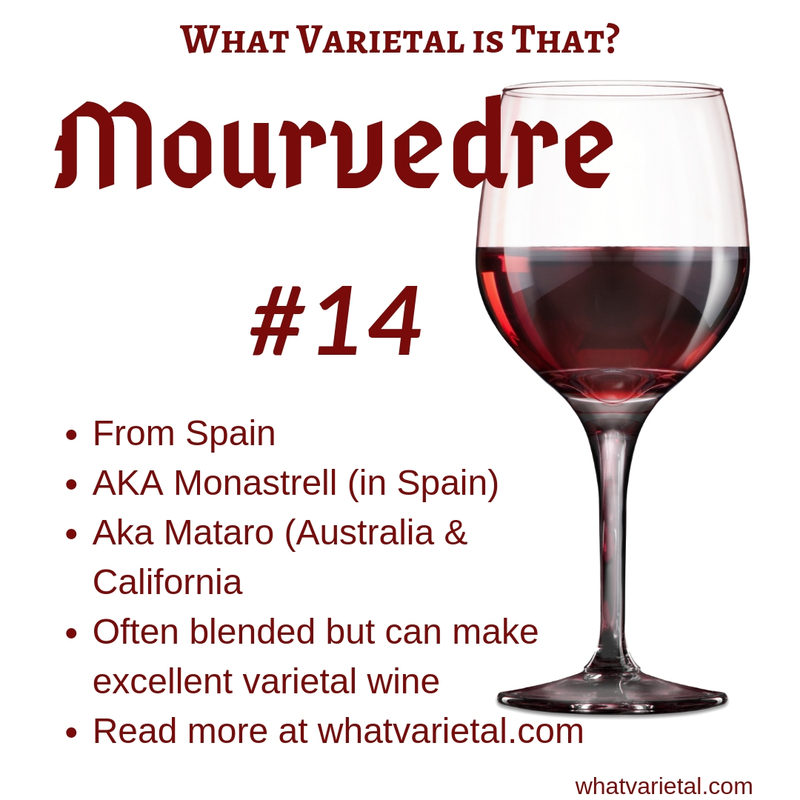 Mourvedre red wines are earthy and rustic. They go well with duck, squab or red meat based stews, or you could try them with Provencal vegetable dishes. GSM wines are just the thing to accompany your Sunday roast lamb. The soft, fruit sweet middle palate will complement the meat without overpowering it. Mourvedre based rose wines go well with any dishes that have been kissed by the Mediterranean sun, say ratatouille or fritto misto, mixed fried seafood. Why not enjoy a chilled bottle of Mourvedre Rose with some tapenade made with Darby's Famous Tapenade Recipe. In his book Daring Pairings, Evan Goldstein includes a description of Mourvedre, along with 18 other alternative varieties. He suggests enjoying a bottle of Mourvedre with a dish of BBQ turkey skewers and caramelised sage onions.